Lentils are an inexpensive, versatile, easy-to-find source of healthy carbohydrates. These disc-shaped pulses make a nutritious base for soups, salads, and a variety of other dishes. A pulse is the seed of a legume. There are different sizes and different types of lentils. You're likely to find green lentils or brown lentils on local grocery store shelves, but there are also lentil varieties including split red lentils, orange, red, yellow, and black lentils. 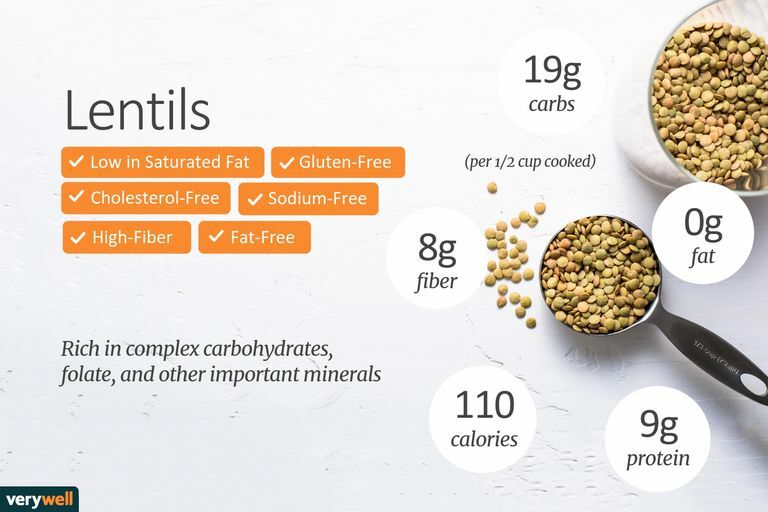 Lentils' impressive nutrition facts, long shelf-life, and easy cooking make them a smart and healthy addition to any diet. Lentils provide a healthy dose of complex carbohydrates. There are 9 grams of starch in a single serving of lentils, which provides the body with quick energy. In addition, you'll benefit from 8 grams of fiber when you consume a half cup of lentils. Fiber helps to stabilize blood sugar, boost satiety, and improve digestive health. Lastly, lentils provide 2 grams of naturally-occurring sugar. Lentils have a glycemic index (GI) of about 35, although the number varies slightly depending on the type of lentil and whether or not they are cooked. As a reference, foods with a GI of 55 or below are considered low glycemic foods. All lentils are considered low glycemic foods. There is no fat in lentils, which makes them a naturally fat-free food. While some nutrition experts caution against the use of fat-free foods for weight loss or healthy weight maintenance, they generally refer to foods that have had fat removed in processing. Foods like lentils that naturally provide good nutrition and no fat are a smart addition to any diet. Each serving of lentils provides a healthy 9 grams of protein. For this reason, many vegans and vegetarians use lentils at lunch and dinner to boost their protein intake. However, lentils are not considered a complete protein. Complete proteins provide all of the essential amino acids that cannot be made by the body and therefore must be consumed in the diet. You'll need to combine lentils with a whole grain or with seeds in order to get all essential amino acids at mealtime. Lentils are packed with nutrients. You'll get 43 percent of your daily recommended intake of folate if you consume a half cup of lentils and you follow a 2000-calorie per day diet. Folate, a B vitamin, helps boost red blood cell production and provides other health benefits. You'll also get 24 percent (171 mg) of your recommended daily intake of phosphorus, 15 percent (1 mg) of your recommended intake of zinc, 13 percent of your recommended intake of vitamin B6, and 15 percent (0.2 mg) of your daily intake of thiamin. A serving of lentils will also provide important minerals including iron (18 percent of your daily target) and copper (27 percent of your daily target). Lentils have been studied by nutrition researchers for years because the food is commonly consumed around the world and because increasing your intake of this versatile food seems to provide health benefits. A review published by the Canadian Medical Association Journal found that including pulses like lentils helps to lower LDL cholesterol (also called "bad" cholesterol). Another review of studies found that increasing intake of pulses like chickpeas, beans, peas, lentils can help both diabetic and non-diabetic patients improve long-term glycemic control in their diets. Lastly, an evaluation of the nutritional value of legumes published in Obesity Reviews determined that "replacing energy-dense foods with legumes has been shown to have beneficial effects on the prevention and management of obesity and related disorders, such as cardiovascular disease, diabetes, and the metabolic syndrome." Study authors suggest replacing high-calorie, high-fat meaty foods (such as burgers and sausage) with lentil-based products or combining meat with lentils in the production of those foods to reduce fat and calorie content. What should I look for when purchasing lentils? When you buy lentils, look for uncracked discs that have not been exposed to dust or moisture. You can buy lentils in pre-packed containers (like bags or boxes), but many stores also sell lentils in the bulk section so you can buy only the amount that you need. You can also purchase canned lentils that are pre-cooked. However, you should check the ingredients list to make sure that no sodium or other unwanted ingredients are added to the product. How do I store lentils and how long will they stay fresh? Store lentils in an air-tight container in your pantry or in another cool dark place. If stored properly, lentils should stay good for up to 12 months. How should I cook lentils? Before cooking lentils, you should rinse the legumes to remove any dirt or dust. Remove any cracked or broken discs. Boil three cups of water and add one cup of lentils. Simmer for roughly 20 minutes, although cooking time will depend on your taste preference and on the variety of lentil used. You don't need a lentil recipe to make the most of this healthy food. If you have a favorite soup or salad recipe, simply toss in a handful to boost the meal's nutrition. According to the American Academy of Allergy, Asthma, and Immunology, lentil allergies are not only possible but also common in children in certain areas of the world (primarily the Mediterranean, Middle East, and some Asian countries). However, the organization acknowledges that the wide variety of lentils can make clinical recommendations and guidelines difficult. Symptoms of a legume (including pulse) allergy may include swelling in the face, difficulty breathing, severe asthma, abdominal pain, nausea, or vomiting, according to the Anaphylaxis Campaign, an allergy support network based in England. If you suspect that you have an allergy to legumes or lentils, speak with your healthcare provider to get a proper diagnosis. Compounds that interfere with nutrient absorption are commonly referred to as "antinutrients." However, the term is misleading because all plants contain these nutrients, which have an effect only when consumed in extremely large quantities. The effects of these nutrients are negligible at the quantities you likely consume lentils. Trypsin inhibitors and phytate are the two "antinutrients" in lentils. Tryspin inhibitors hinder the function of an enzyme called trypsin, which helps break down proteins. Phytate (phytic acid) binds minerals like iron and zinc, impairing their ability to be absorbed and used by the body—but it also contributes anti-cancer properties and plays other preventive roles in conditions like heart disease and insulin resistance. So, unless you have a condition that may be impacted by these nutrients (such as iron-deficiency anemia) you shouldn't worry about them too much. As a precautionary measure, rinsing your lentils before cooking and cooking them appropriately reduces the amount of phytate they contribute to your diet.